Man cannot live by Bread alone? Watch me! Basic Flatbread is one of the earliest examples of cooked food. So when you go back to the word's Persian origin, it is not surprising to learn that Naan may simply have meant "food". Traditional Naan is a lean Bread made with Flour, Water and Salt. As techniques advanced, the Bread was leavened with a starter or Yeast. Cooked in the intense heat of a tandoor, a cylindrical clay oven, the Bread bakes in just minutes to take on a puffy, blistered appearance. 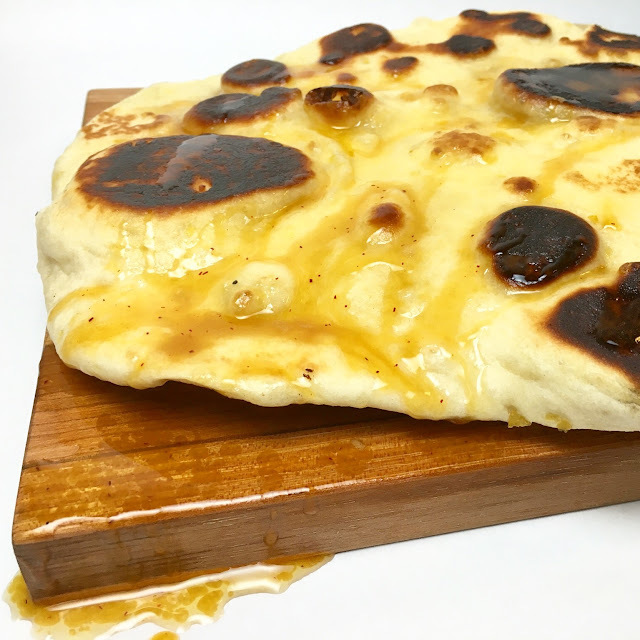 Otherwise unadorned, freshly baked Naan is most often served brushed with Ghee, a form of Clarified Butter common in Indian cooking. Recipes have evolved over time, making use of different ingredients as they became available. Milk, Yogurt, Oil, Eggs and Sugar can all be found in different recipes for Naan Dough. These enriching ingredients all result in a more tender final product. One wouldn't likely think of Naan as a dessert item, but it is such a basic Bread that it can easily to pushed in that direction. By making an enriched Naan Dough with Milk, Yogurt and Eggs (and some Candied Lemon Peel), and then brushing it in a special Honey Saffron Ghee, this Naan is decidedly dessert appropriate. The most satisfying Naan is going to be an à la minute preparation. Don't make Naan expecting it can sit around for days. You'll want it hot off the griddle (or right out of the tandoor), freshly soaked with Honey Saffron Butter. Ghee is a staple of South Asian and Arabic cuisines. As a type of Clarified Butter, Ghee is made by separating the Oil in Butter from the Milk Solids. For ordinary Clarified Butter, this is done through a gentle heating process. But with Ghee, the melted Butter is brought to a higher temperature so that the Milk Solids caramelize. The caramelization process brings a deep amber color and a nutty flavor to the remaining Oil. 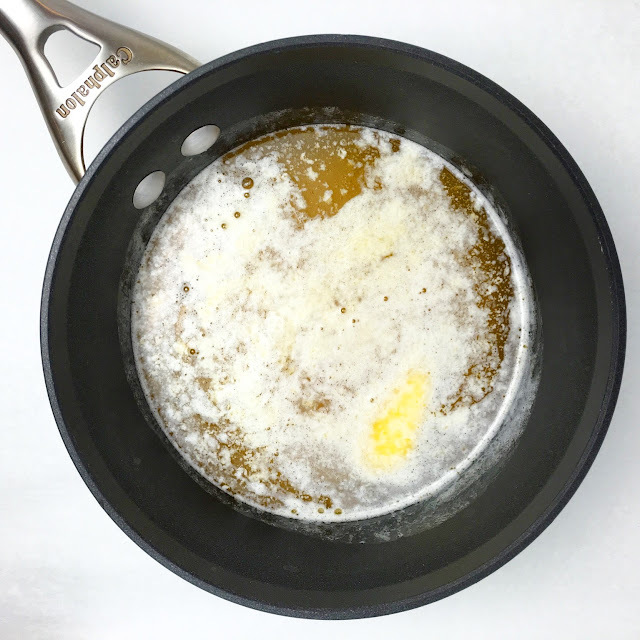 With a high smoke point of approximately 482 degrees Fahrenheit (250 degrees Celsius), Ghee is extremely versatile for almost all cooking applications, including frying. To make Ghee, begin by bringing Butter to a boil in a large pot. As soon as it reaches a boil, stir the Butter and reduce the heat to medium. Let the Butter gently simmer until a foam forms on the surface. This is an indication that the Milk Solids are separating from the Oil. Stir the Butter again and continue to let it simmer until it foams a second time. As it continues to cook, the Oil will turn a rich amber color and take on a nutty aroma. The longer you heat the Ghee, the deeper and richer the color and flavor. However, do not allow the Milk Solids to burn. The Milk Solids should be sufficiently caramelized after 7-10 minutes. Remove the Ghee from the heat and strain it through a cheese cloth or fine mesh sieve, carefully trying not to pour any of the remaining Milk Solids from the pot. 454g (~2 cups) of Butter will yield approximately 360g (~1.5 cups) of Ghee. The loss in yield comes from the Milk Solids and evaporation. When making Ghee for this recipe, start with 454g (~2 Cups) of Butter. Reserve 120g (~0.5 cup) of the yield to make the Honey Saffron Butter. Save the remaining Ghee to use in the Naan Dough recipe and for greasing the griddle when cooking the Naan. You will not need all of the plain Ghee for this recipe. Any remaining Ghee can be saved in an airtight container at room temperature for up to a month or for several months in the refrigerator. 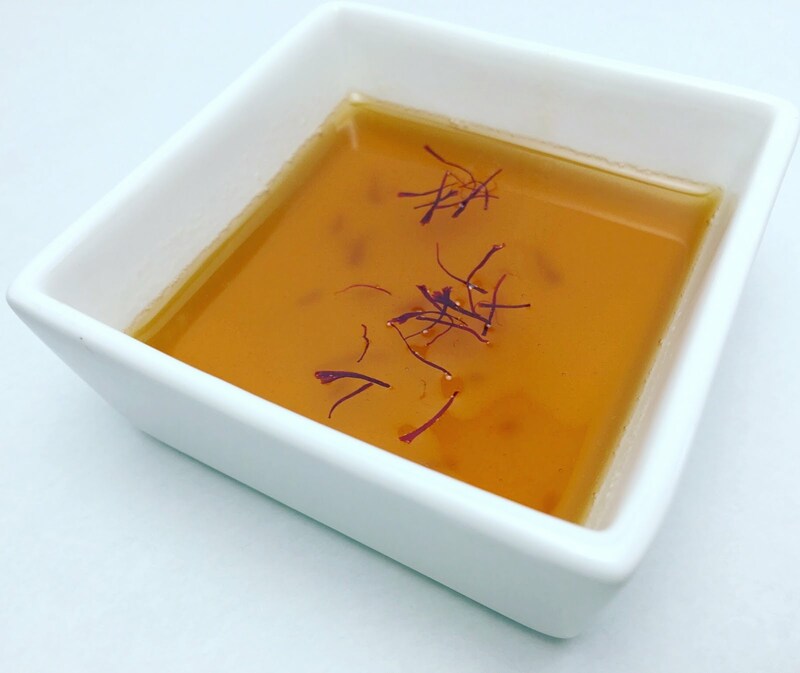 To make the Honey Saffron Ghee, place the 120g of strained Ghee in a clean pot over low heat with Saffron Threads and let them infuse for approximately 10 minutes. The amount of Saffron to use is largely a matter of taste... and cost, seeing as Saffron is the world's most expensive spice. After 10 minutes, slowly stream the Honey into the warm, infused Ghee while whisking. The Honey Saffron Ghee can be made in advance, but it will separate and solidify as it cools. The Honey Saffron Ghee can be saved in an airtight container at room temperature for up to a month or for several months in the refrigerator. Gently warm and stir the Honey Saffron Ghee before using. Naan is a very mild flavored Bread, which is perhaps why the Garlic variety is so popular. And if Garlic works for a savory version, why not come up with something special for the dessert variety? 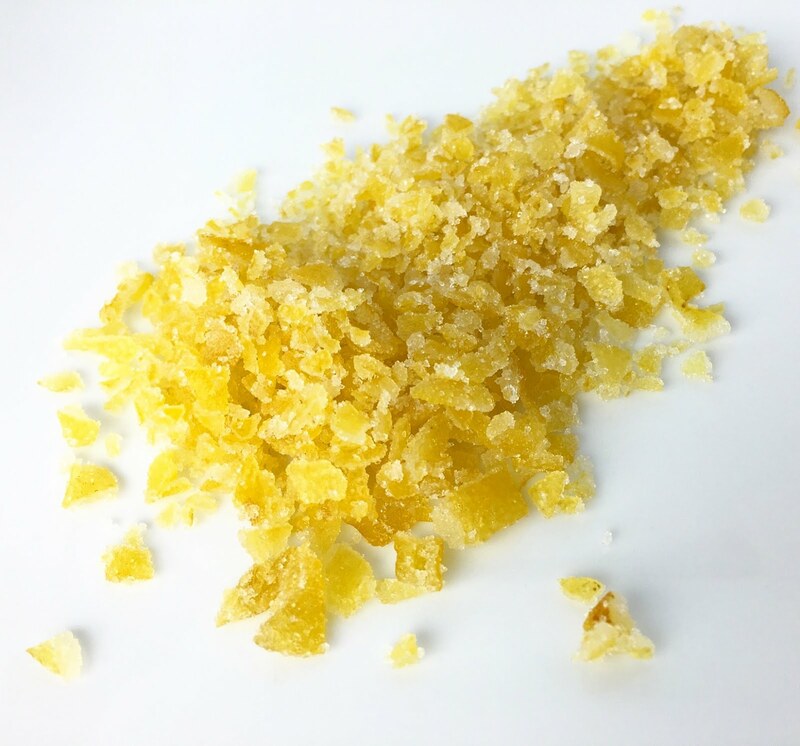 Maybe Candied Lemon Peel for a little citrus kick? It is very easy to candy the peel from any citrus fruit, and the resulting product can be used as anything from a stand alone snack to a (very) edible garnishes. To make Candied Lemon Peel for this recipe, start by cutting long thin strips of Lemon Peel with a peeler or paring knife. Be careful to avoid the white pith. If you cut too deep into the pith, carefully remove it with a paring knife. Place the Lemon Peels in a pot of water and bring it to a boil. As soon as the water reaches a boil, strain the Lemon Peels, refill the pot with cold water, and return the pot to the heat. Blanche the Lemon Peels for a total of three times. The blanching process helps to soften the Lemon Peels and removes much of the bitterness from the citrus oils without losing the flavor. Once the Lemon Peels have been Blanched, they are candied in a Simple Syrup. 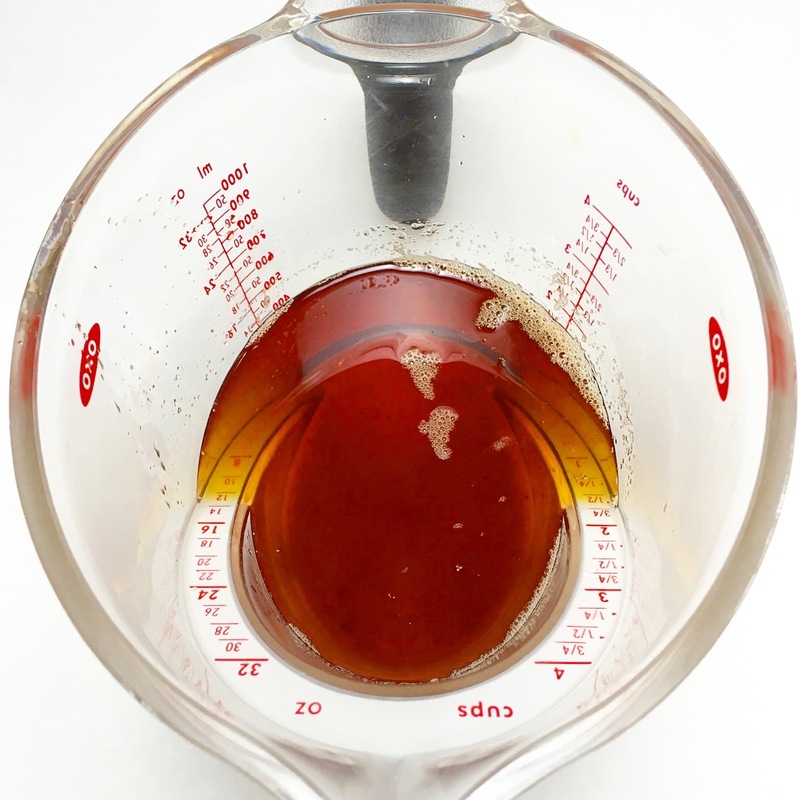 Make a Simple Syrup by combining equal parts Water and Sugar by weigh. Bring the mixture to a boil and add the Lemon Peels. Reduce the heat to keep the Simple Syrup at a gentle simmer. 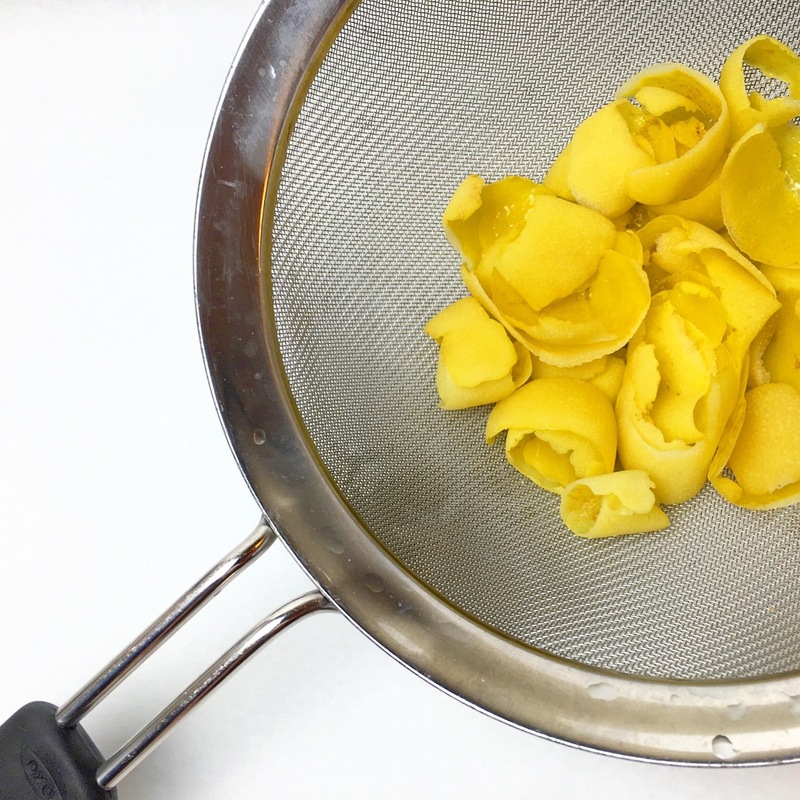 Cook the Lemon Peels until they turn translucent - approximately 10 minutes. Once the Lemon Peels are soft and translucent, strain them from the Simple Syrup. You may want to save the Simple Syrup for future use! If you are using the Candied Lemon Peels for the Naan Dough, finely chop them and use them immediately. For longer-term storage, place the Candied Lemon Peels in a bowl of Sugar, coating them well. Set the bowl aside to dry for a couple of hours (ideally overnight). When the Candied Lemon Peels are dry, finely chop them. Any type of Candied Citrus Peel will keep almost indefinitely when stored in an airtight container at room temperature. The mixing process for the Naan Dough is a multi-staged process. Because enriching ingredients (e.g. Oil, Sugar, Eggs) inhibit the development of gluten, some are held back in the initial mix, added to the Naan Dough after several minutes of kneading to ensure that the gluten structure is sufficiently strong. Begin by combining the Water and Milk and heating it to approximately 95 degrees Fahrenheit (35 degrees Celsius) or just barely warm to touch. 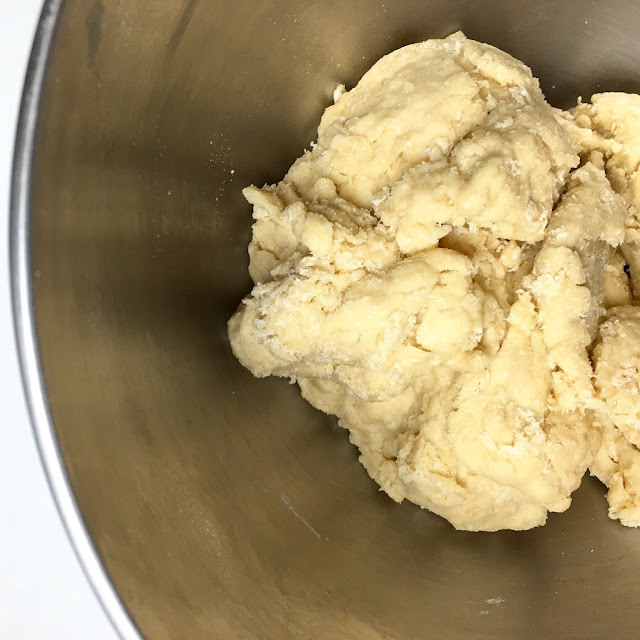 Combine the warm liquids with the Yeast in the bowl of an electric mixer fitted with a dough hook attachment and let it rest for 2-3 minutes, activating the Yeast, which requires warm hydration. Add the Egg, Yogurt, Bread Flour, Sugar and Salt to the mixer bowl. Mix the ingredients on low speed until they come together to form a shaggy Naan Dough - approximately 1-2 minutes. Stop the mixer, cover the bowl with a piece of plastic wrap or a damp towel, and set it aside to rest for approximately 10 minutes. The resting period is referred to as Autolyse. In its purest form, Autolyse is only used in making lean Breads. By setting the unkneaded Dough aside to rest, the Flour hydrates and the gluten structure begins to develop without over-mixing, which can introduce too much oxygen into the Dough and result in less flavorful Bread. Some will argue that resting a Yeast Dough containing Eggs, Yogurt and, most notably, Salt will kill the Yeast. However, it takes a lot of Salt to do any real harm. The Yeast in this Naan had no problem holding their own! 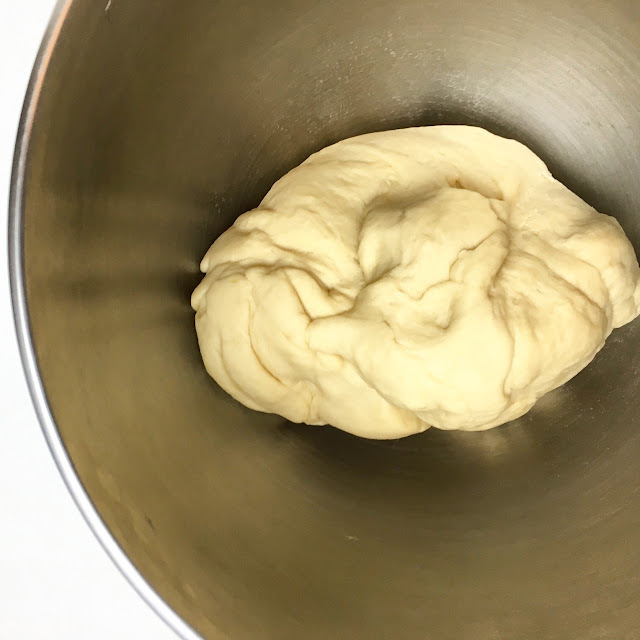 After the Dough has rested, return it to the mixer fitted with a dough hook attachment and knead the Naan Dough until it is smooth and elastic - approximately five minutes. Only after the gluten structure is sufficiently developed are the Ghee and diced Candied Lemon Peels added to the Naan Dough. If they are added too soon, it can be difficult (or impossible) to develop a sufficiently strong gluten structure, no matter how hard you try! While kneading, add the diced Candied Lemon Peels and slowly stream in the Ghee. 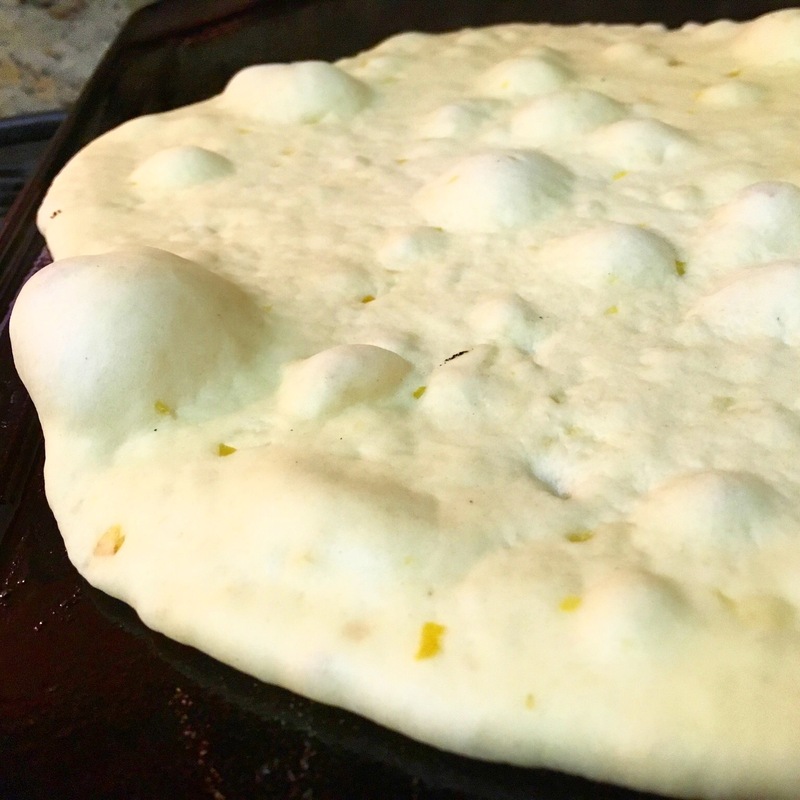 As the diced Candied Lemon Peels and Ghee are kneaded into the Naan Dough, the Naan Dough will initially appear very wet and may appear to break. However, the Naan Dough will eventually come back together into a smooth and elastic ball. Gather the Naan Dough into a smooth ball and transfer it to an oiled bowl or proofing container. Cover the Naan Dough and let it proof until doubled in size - approximately 45-60 minutes (keep in mind that time estimates will vary dramatically based on the temperature in your kitchen, so keep an eye on the Naan Dough rather than set a timer). When it has sufficiently proofed, degas and turn the Naan Dough - remove the Naan Dough from the proofing container and gently fold the outside edges in toward the center. At this point, it is possible to refrigerate the Naan Dough for up to 48 hours if you would like to cook the Naan at a later point. Press the Naan Dough into a square that is no more than 1" thick, wrap it well in plastic wrap and place it in the refrigerator. It is important to sufficiently flatten the Naan Dough so that it will chill quickly and halt the fermentation process. If the Naan Dough is too thick, the center will continue to proof. If you will be cooking the Naan immediately, divided the Naan Dough into eight 120g portions. Form the portions into a tight balls and place them on a parchment lined sheet tray. Loosely cover the portioned Naan Dough with a piece of plastic wrap and let the Naan Dough proof until doubled in size - approximately 30-45 minutes. As the Naan Dough proofs, preheat a stovetop griddle or preheat an oven with a baking stone on an upper rack to 500 degrees Fahrenheit (232 degrees Celsius). Also, gently rewarm the Honey Saffron Ghee at this time. When they have sufficiently proofed, roll two portions of the Naan Dough (the pieces of Naan will be cooked two at a time) on a lightly floured surface to approximately 8" in diameter. 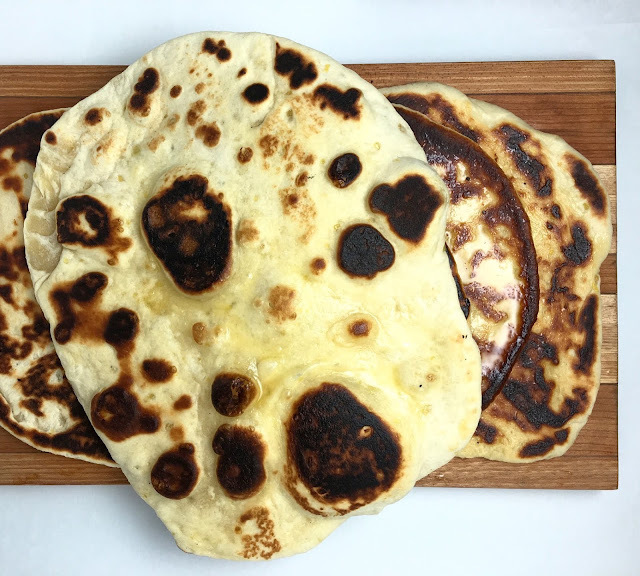 Thicker Naan will not bubble up as much when cooked and will have a more chewy texture. Thinner Naan will be crispier. If using a griddle, brush the hot griddle with some of the reserved Plain Ghee (do not use the Honey Saffron Ghee - the Sugar in the Honey will burn quickly on the hot griddle). Place the rolled Naan Dough on the griddle until it browns and blisters - approximately 2-3 minutes. Gently brush the uncooked side of the Naan Dough with some Plain Ghee and flip the Naan, cooking the reverse side until it too browns and blisters. Remove the Naan from the griddle and generously brush it with the Honey Saffron Ghee. Repeat the rolling and cooking process with the remaining portions of Naan Dough, adjusting the heat of the griddle as needed. If using a baking stone in the oven, set the now preheated oven to broil. Place the rolled Naan Dough on the baking stone until it browns and blisters - approximately 3 minutes. Remove the Naan from the oven and generously brush it with the Honey Saffron Ghee. Allow the oven to return to temperature and repeat the process with the remaining portions of Naan Dough. Baked Naan is best served immediately after it is made. It will quickly become dry and stale, and it is not recommended for storage. 1. Place the Butter in an uncovered pot and gently bring it to a boil. When the Butter reaches a boil, reduce the heat to medium and let it simmer until a foam forms on the surface. As the foam forms, gently stir the Butter. Chef's Note: The foaming of the Butter is an indication that the Milk Solids are separating from the Oil. 2. Continue heating the Butter until it foams a second time and turns a golden amber color - approximately 7-10 minutes. The Milk Solids should have separated to the bottom of the pot. Chef's Note: For a richer flavor, continue heating the Ghee until the Milk Solids take on a deeper amber color, but do not burn the Milk Solids. 3. Remove the Ghee from the heat and gently strain it through a piece of cheese cloth or a fine mesh sieve. Try not to pour any of the Milk Solids from the pot. The Butter should yield approximately 360g of strained Ghee. 4. Set aside 240g (1 Cup) of the strained Ghee for use in the Naan Dough recipe and for cooking the Naan. Place the remaining 120g (0.5 Cup) of the strained Ghee in a clean pot over low heat. Stir in the Saffron Threads and let them infuse over low heat for approximately 10 minutes. After 10 minutes, slowly stream the Honey into the strained Ghee while whisking. Either use the Honey Saffron Ghee immediately or set it aside to cool and store in an airtight container. 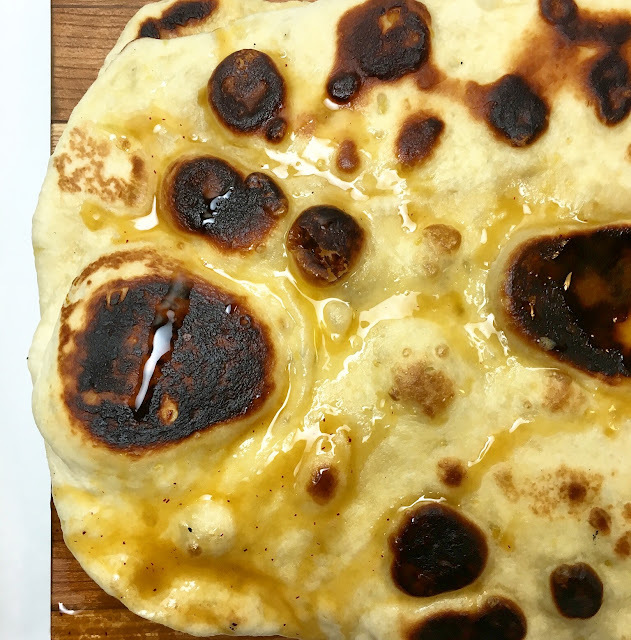 Chef's Note: The recipe makes more Plain Ghee than is needed for the Naan Dough recipe and for cooking the Naan; however, it keeps well and is perfect whenever a flavorful, high-smoke point oil is needed. - Ghee will keep well in an airtight container at room temperature for up to a month or for several months in the refrigerator. 1. Using a vegetable peeler or paring knife, peel the Lemon into long, wide strips. As you peel, try to avoid as much of the white pith as possible. If there is too much pith remaining on the Lemon Peels, cut it away with a sharp paring knife. 2. Blanche the Lemon Peels by placing the strips into a medium pot of water and bringing it to a boil. As soon as the water is boiling, remove it from the heat and strain the Lemon Peels from the water. Refill the pot with cold water, place the Lemon Peels back into the pot and bring the water to a boil. Repeat the process of boiling and straining the Lemon Peels for a total of three time. 3. Set the blanched Lemon Peels aside. Make a Simple Syrup by combining the Sugar and Water in a medium pot and bringing it to a boil. Once the mixture is boiling, reduce the heat to keep the Simple Syrup at a low simmer. Candy the blanched Lemon Peels in the Simple Syrup, letting them simmer until they turn translucent - approximately 10 minutes. When the Candied Lemon Peels are soft and translucent, strain them from the Simple Syrup. Chef's Note: You may want to save the Lemon Simple Syrup for future use. 4. Place the Candied Lemon Peels in a bowl of Sugar, coating them well. Set the bowl of coated Candied Lemon Peels aside to dry for a couple of hours (ideally overnight). Toss the Candied Lemon Peels occasionally to prevent them from sticking together. The Candied Lemon Peels will take longer to dry in humid weather. Once dry, shake any excess Sugar from the Candied Lemon Peels. Using a sharp chef's knife, finely chop the Candied Lemon Peels. Chef's Note: The recipe makes more Candied Lemon than is needed for the Naan Dough recipe; however, it is just as easy to make a larger batch, it keeps almost indefinitely and you will be able to use it in countless recipes and as a flavorful garnish. - The Candied Lemon Peels will keep well for months when stored at room temperature in an airtight container. 1. Combine the Water and Milk and gently heat the liquids to approximately 95 degrees Fahrenheit (35 degrees Celsius) or until just barely warm to touch. Combine the warm liquids with the Yeast in the bowl of an electric mixer fitted with a dough hook. Allow the mixture to sit for 2-3 minutes. 2. Add the Egg, Yogurt, Bread Flour, Sugar and Salt to the mixer bowl. Mix the ingredients on low speed until they come together to form a shaggy Naan Dough - approximately 1-2 minutes. 3. Stop the mixer and cover the bowl with a damp towel or a piece of plastic wrap. Allow the Naan Dough to rest for 10 minutes. 4. Return the bowl the mixer and knead the Naan Dough until it becomes smooth and elastic - approximately five minutes. Add the Candied Lemon and slowly stream in the Ghee. Continue kneading the Dough until it again becomes smooth and elastic. Chef's Note: The initial kneading period develops the gluten structure without the inhibiting factors of the pieces of Candied Lemon or fat from the Ghee. Once the structure is sufficiently strong, these ingredients can be added. The second stage of kneading completely develops the gluten structure with all of the ingredients in the Naan Dough. 5. Gather the Naan Dough into a smooth ball and transfer it to an oiled bowl or proofing container. Cover the Naan Dough and let it proof until doubled in size - approximately 45-60 minutes. 6. When it has sufficiently proofed, degas and turn the Naan Dough - remove the Naan Dough from the proofing container and gently fold the outside edges in towards the center. 7. Divide the Naan Dough into eight 120g portions. Form the portions into tight balls and place them on a parchment lined sheet tray. Loosely cover the portioned Naan Dough with a piece of plastic wrap and let the Naan Dough proof until doubled in size - approximately 30-45 minutes. 8. As the Naan Dough proof, preheat a stovetop griddle or preheat an oven with a baking stone on an upper rack to 500 degrees Fahrenheit (232 degrees Celsius). Also gently heat the Honey Saffron Ghee until it is warm and liquid. 9. When they have sufficiently proofed, roll two portions of Naan Dough on a lightly floured surface to approximately 8" in diameter. The Naan will be cooked two pieces at a time. Chef's Note: Roll the Naan Dough thinner for crispier Naan or thicker for chewier Naan. 10a. If using a griddle, brush the hot griddle with some of the reserved Plain Ghee. Place the rolled Naan Dough on the griddle until it browns and blisters - approximately 2-3 minutes. Gently brush the uncooked side of the Naan Dough with some Plain Ghee and flip the Naan, cooking the reverse side until it too browns and blisters. Remove the Naan from the griddle and generously brush it with the Honey Saffron Ghee. Repeat the process with the remaining portions of Naan Dough. 10b. If using a baking stone in the oven, set the now preheated oven to broil. Place the rolled Naan Dough on the baking stone until it browns and blisters - approximately 3 minutes. Remove the Naan from the oven and generously brush it with the Honey Saffron Ghee. Allow the oven to reheat for 2-3 minutes and repeat the process with the remaining portions of Naan Dough. - Baked Naan is best served immediately after it is made. It will quickly become dry and stale, and it is not recommended for storage. - The Naan Dough can be refrigerated for 2-3 after the initial rise and before it is portioned. Oh this looks so yummy and looks so easy to make! Thanks for sharing this recipe.